MUSIC CITY VOCAL GROUPS-GREASY LOVE SONGS OF TEENAGE ROMANCE, REGRET, HOPE AND DESPAIR. Described as containing “fifty slices of tear-stained wax,” Music City Vocal Groups-Greasy Love Songs Of Teenage Romance, Regret, Hope and Despair is Ace Records latest retrospective of Ray Dobard’s Music City label. Its origins can be traced back to 1950. That’s when Ray formed a record shop, Berkeley’s Music City in Adeline Street, San Francisco. Not long after that, Ray founded his first record label Delcro Records. This was Ray’s latest business. Born in New Orleans, on 31st August 1920, Ray Dobard was born into a working class family. Ray was a born entrepreneur. This became apparent when he moved to Berkeley, California, with his wife Jeanne. His first business venture was a construction company. Soon, Ray was buying up properties. Before long he had a vast property portfolio. However, like all good entrepreneurs, Ray realised the importance of having a diverse portfolio. So in 1950, Ray decided to open a record shop, Berkeley’s Music City in Adeline Street, San Francisco. Not long after that, Ray founded his first record label Delcro Records. Three years later, with his latest business expanding his record store, now called Music City Record Store moved to new premises. Music City Record Store’s new premises were at 1815 Alcatraz Avenue. Behind the shop, there was an empty space. Ray decided to build a small studio. This meant he could record artists, release their music on his own label and sell them in Music City Record Store. That was the plan. However, things didn’t get off to a good start. In the early days, Ray recorded everything from jazz, jump blues and gospel in his studio. There was a problem though. The records he recorded and released weren’t selling. Then his luck changed when and R&B quartet called The Stars entered Music City Record Store to record a song midway through 1954. The song The Stars wanted to record was Annie Pulled A Hum Bug. It was the answer to The Midnighters’ Annie singles. Annie Pulled A Hum-Bug was a song The Stars wrote. They wrote all their own material. Melvin Dennis was the lead singer and drummer. He was one of three soldiers from Camp Stoneman army base, thirty miles away in Pittsburgh. Artis Johnson was he other member of The Stars. He was just sixteen and in still in high school. Despite their different backgrounds, The Stars gelled musically. Immediately, Ray like The Stars and decided to take a chance on them. There was one thing he didn’t like, their name. Ray decided that The Stars should change their name They became The Midnights. There was a problem though. The Midnights could be confused with The Midnighters. So, Ray signed an indemnity, stating that The Stars “were not to be confused with The Midnighters.” Having covered himself legally, he released Annie Pulled A Hum-Bug. On its release, Annie Pulled A Hum-Bug was a commercial success. Ray’s luck had changed. Following the success of Annie Pulled A Hum-Bug, Ray decided to release further vocal group singles. However, this wouldn’t include The Midnights. The Camp Stoneman army base closed. Its personnel were sent to other bases. 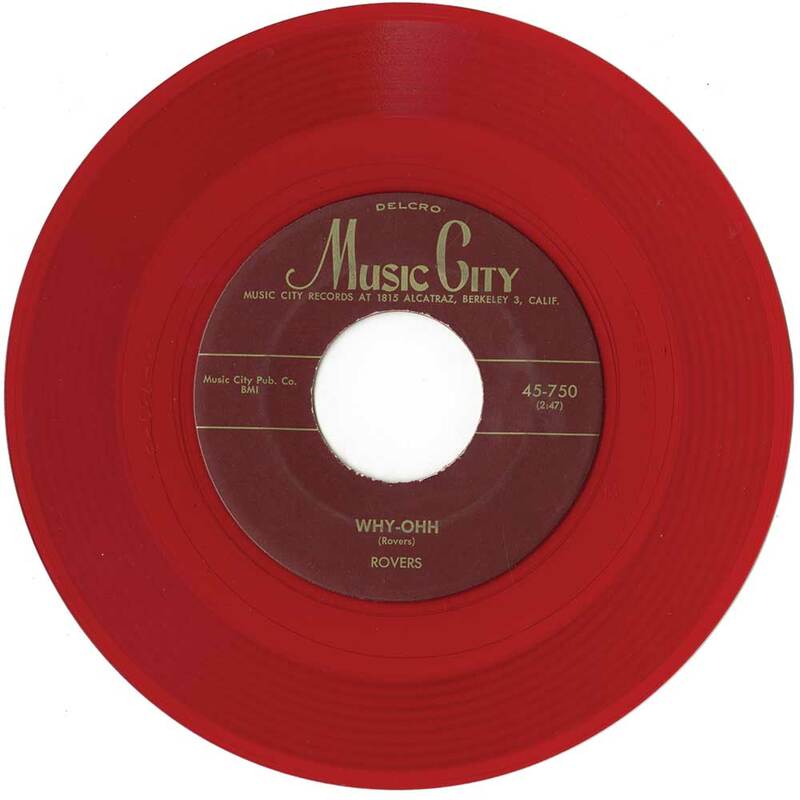 As a result, The Midnights only released one more single, Cheating On Me, which features on Music City Vocal Groups-Greasy Love Songs Of Teenage Romance, Regret, Hope and Despair. It’s a song that oozes emotion and hurt. So does No Other Way Round, a lost song from The Midnights. This is one of thirty-seven previously unreleased tracks on Music City Vocal Groups-Greasy Love Songs Of Teenage Romance, Regret, Hope and Despair. There’s a total of fifty tracks spread over two discs on Music City Vocal Groups-Greasy Love Songs Of Teenage Romance, Regret, Hope and Despair. Of the fifty tracks, thirty-seven have never been released before. Some including The Midnights’ No Other Way Round were feared lost They were only discovered recently. Some of the tracks are real hidden gems. 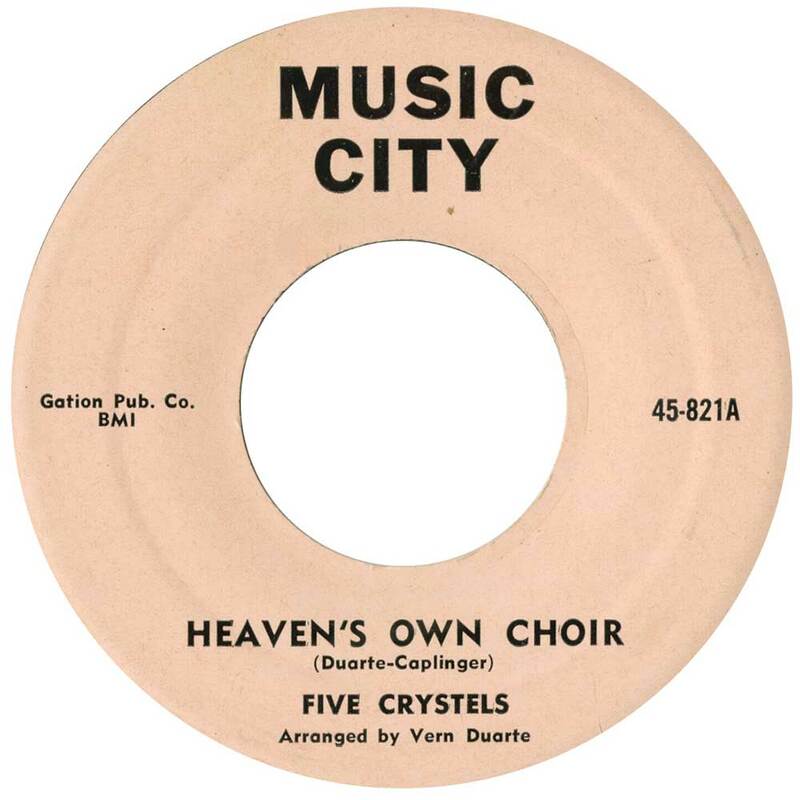 Indeed, Music City Vocal Groups-Greasy Love Songs Of Teenage Romance, Regret, Hope and Despair released by Ace Records is best described as a mixture of classics, old friends, hidden gems and rarities. You’ll realise that when I tell you about some of the highlights of Music City Vocal Groups-Greasy Love Songs Of Teenage Romance, Regret, Hope and Despair. Disc one of Music City Vocal Groups-Greasy Love Songs Of Teenage Romance, Regret, Hope and Despair features a total or twenty-five tracks. There’s contributions from The Pagans, The Midnights, The Holidays, The Gaylarks, The Gayteens, The Dialtones, The Five Crystels and The Holidays. Some of the groups feature twice, or in the case of The Gaylarks, three times. This is no bad thing, given the quality of music. It epitomises everything that’s good about doo wop. So much so, that picking the highlights of Music City Vocal Groups-Greasy Love Songs Of Teenage Romance, Regret, Hope and Despair isn’t going to be easy. However, here goes. The Pagans’ Lucille opens Music City Vocal Groups-Greasy Love Songs Of Teenage Romance, Regret, Hope and Despair. It’s never been released before. That seems strange. It literally oozes quality. Written by Clyde McPhatter, straight away, you realise something special is unfolding. A soul-baring lead vocal and slow, emotive harmonies prove a beautiful, and emotive combination. 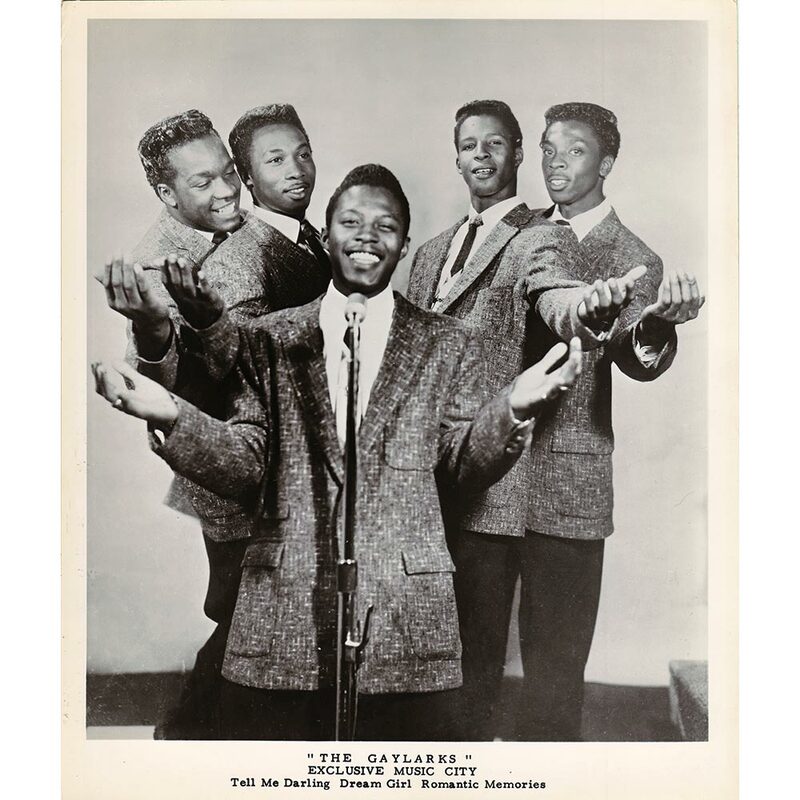 Morrine was released by The 5 Campbells as a single in 1956. The 5 Campbells were still students at the McClymonds High School, In West Oakland, when they recorded Morrine. They were a short lived group. Their only single was Morrine, which featured a needy, soulful vocal. It was a tantalising taste of what they were capable of. The Holidays were just students at Oakland High School when they recorded for Music City Records. Their first contribution is Angel In My Heart, which was recorded in 1958. So was Station (L-O-V-E). Neither have been released before. That’s not because of the quality. Both tracks could’ve been released as a single. Especially, Angel In My Heart. With a dramatic arrangement and punchy harmonies, this proves the perfect backdrop for a hopeful vocal. Alan Richardson takes charge of the lead vocal on The Five Crystels’ Heaven’s Own Choir. This song will be familiar to many people. It was released as a single in 1958, with Path Of Broken Hearts on the B-Side. This version hasn’t been heard before. The reason for this is, is that it’s an alternate version of the vocal. So good is this version, that it’s almost as good as the original. Robert Rose wrote The 5 Lyrics 1956 single I’m Travelling Light. Ray Dobard received the single through the post. When he listened to the song, decided to release it. It features an understated arrangement. That allows Robert Rose’s lead vocal and harmonies to shine. They take centre-stage, where they quite rightly. No wonder, given a vocal where hurt and heartbreak are ever-present. I’m Coming Over To You was recorded by The Girls in 1957. Sadly, it was never released. Instead, it lay in the vaults of Music City Records. That’s until it was rediscovered for this compilation by Jim Dawson. For that we should be grateful. Of all the unreleased tracks on disc one, this is one of the best. There are two acpappellas on disc one. This includes The Marcels’ version of So Hard To Please and The Idols’ version of Forever And A Day. Of the two tracks, The Idols’ version of Forever And A Day stands out. They go back to their roots, singing unaccompanied and showcase their vocal prowess. My final choice from disc one of Music City Vocal Groups-Greasy Love Songs Of Teenage Romance, Regret, Hope and Despair, is The Chantels All The Days Of My Life. Recorded in 1958, it was never released. That’s despite All The Days Of My Life featuring the quality you’d expect from The Chantels. 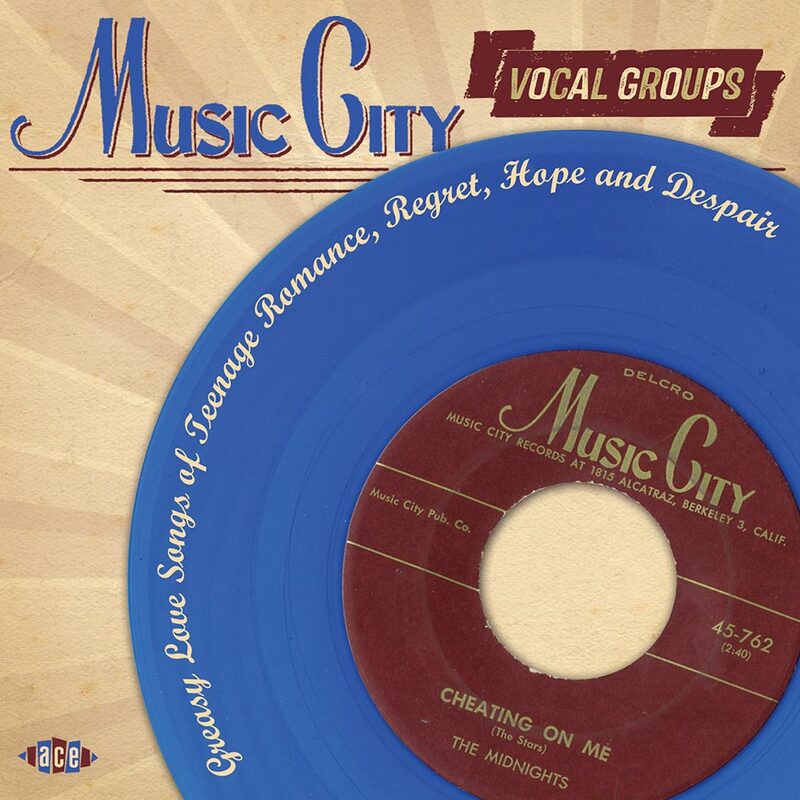 Disc two of Music City Vocal Groups-Greasy Love Songs Of Teenage Romance, Regret, Hope and Despair picks up where disc one left off. It’s quality doo wop all the way. There’s contributions from The Klixs, The Derbys, The Treniers and The Marcels. Some groups on disc one make a reappearance. This includes The Five Crystels, The Holidays and The Marcels. Some groups feature twice, including Bob and Jessie, The Crescendos, The Derbys, The Five Crystels, The Klixs and The Marcels. Again. familiar faces, hidden gems and rarities sit side-by-side. So, picking the highlights of disc two of Music City Vocal Groups-Greasy Love Songs Of Teenage Romance, Regret, Hope and Despair won’t be easy. Bob and Jessie open disc two of Music City Vocal Groups-Greasy Love Songs Of Teenage Romance, Regret, Hope and Despair with Church On The Hill (Take 1) and Church On The Hill (Take 2). Take 1 has never been released before, while Take 2 featured on a compilation released in 2011. So good are both versions that’s it’s almost impossible to say which is best. Personally, I prefer the unreleased version. It literally bristles with emotion. Just like Bob and Jessie, the Italics feature twice. Their first contributions is the beautiful There’s A Girl. Recorded in 1962, it was never released. It makes its debut here. So does I Feel So Blue, which was also recorded in 1962. There are similarities with There’s A Girl. Both feature understated, lo-fi arrangements and heartbroken vocals. The Klixs contribute Elaine and Our Love Is Here To Stay. Their first contributions is an alternate version of Elaine. It features a heartfelt, needy vocal. Despite the song’s undoubted quality, it’s never been released before. Just like Elaine, Our Love Is Here To Stay has never been released before. Recorded in 1957, it’s a cover of a song written by George and Ira Gershwin. Here, The Kliks reinvent a familiar song, and breath new life into it. Having featured on disc one, The Five Crystels make a welcome return on disc two. They contribut Path Of Broken Hearts and Ten Commandments Of Love. Path Of Broken Hearts is the best of the two tracks. It was released as a single in 1958. Accompanied by rasping horns and harmonies, Alan Richardson delivers another vocal masterclass. The Derbys recorded Lonely One and Happy Birthday Baby in 1962. Neither track was released as single. Lonely One seems to draw inspiration from The Drifters. It features a soulful, heartfelt vocal. The result is a classy soulful, slice of doo wop that’s a real find. Happy Birthday Baby shows another side of The Derbys. It’s an a cappella cover of a song that gave The Tune Weavers a hit single in 1957. Another group making a welcome return on disc two are The Marcels. So Hard To Please is their first contribution. Released in 1958, it’s never been released. It features a vocal that’s full of frustration and sadness. So much so, that you feel for the lead vocalist’s plight. Wait For Me is an a cappella recorded in 1956. Again. it’s never been released before is something of a find. The Crescendos feature twice on disc two. Both tracks, Last Date and Teenage Prayer, are full of teenage angst. Last Date was recorded in 1960, but was never released. Despite that, it’s one of the highlights of the unreleased tracks. Literally, Last Date oozes angst and heartbreak. The same can be said of Teenage Prayer, which was released as a single in 1961. Written by Bernie Lowe and Bickley Reichner, it’s a single that captures another musical era. Sixty years ago, The Rovers released Why-Ohh as a single in 1954. This was one of the earliest singles Ray Dobard released. Sadly, commercial success eluded this tale of betrayal and heartbreak. Salute To Johnny Ace is The Rovers’ other contribution. A sombre affair, it features the same quality as Why-Ohh. Desiree is my final choice from disc two of Music City Vocal Groups-Greasy Love Songs Of Teenage Romance, Regret, Hope and Despair. It was recorded in 1963, but never released. Sadly, the artist is unknown. That’s a pity, as it’s a beautiful slice of doo wop. Classics, familiar faces, hidden gems and rarities feature on Music City Vocal Groups-Greasy Love Songs Of Teenage Romance, Regret, Hope and Despair. There’s a total of fifty tracks. Thirty-seven of them have never been released before. Many of them ooze quality, and they’re a welcome addition to Music City Vocal Groups-Greasy Love Songs Of Teenage Romance, Regret, Hope and Despair. Often, these tracks were recorded, but never released as a single. In many cases, this is a missed opportunity. Many of the unreleased tracks could’ve and should’ve been released as a single. For whatever reason, that never happened. That must have been a huge disappointment to the artists involved. Belatedly, these songs are enjoying their moment in the sun. Over forty years after they were recorded, they’re getting the opportunity to be heard by a wider audience. I for one welcome this. There’s many a hidden gem on Music City Vocal Groups-Greasy Love Songs Of Teenage Romance, Regret, Hope and Despair. Among the hidden gems are alternate versions of singles and a cappellas. Then there’s the singles. Many of the singles will be familiar to fans of doo wop. Especially, anyone familiar with Ray Dobard’s legendary Music City label. 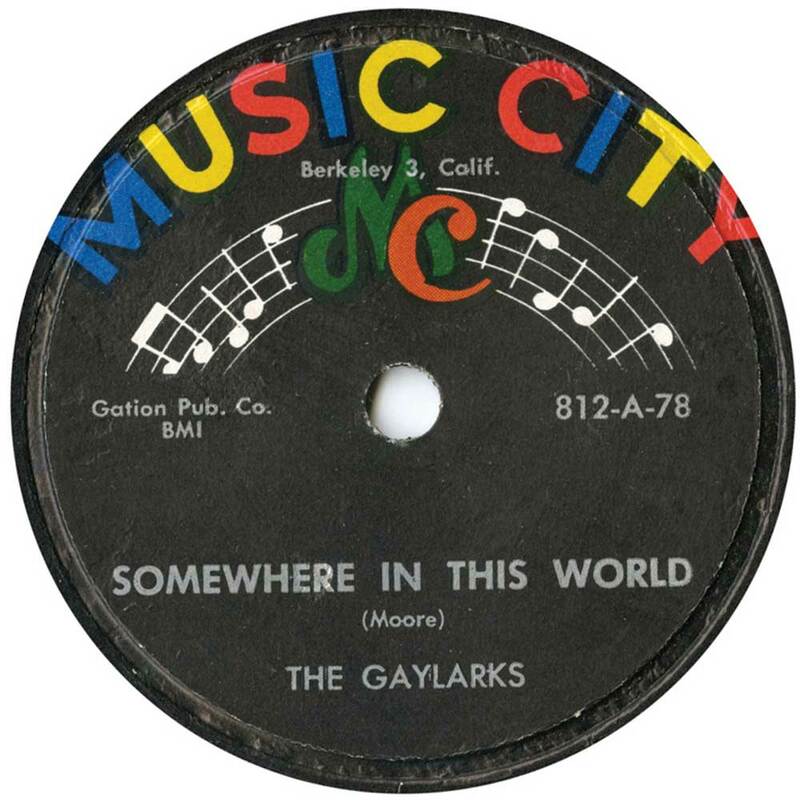 Music City was one of the finest doo wop labels. They were responsible for some of doo wop’s finest hours. Incredibly, Ray Dobard who founded such a successful label, hand’t a musical background. Instead, he was an entrepreneur, who had built several successful businesses. Despite the amount of success Ray Dobard’s other companies enjoyed, they’ll not be remembered as fondly as his Music City, one of doo wop’s greatest labels. That’s why when Ace Records release a compilation of music released by Ray Dobard’s Music City label, it’s always to critical acclaim. That’s the case with Music City Vocal Groups-Greasy Love Songs Of Teenage Romance, Regret, Hope and Despair. It’s a lovingly compiled compilation which will be of interest to anyone who enjoys doo wop or the music of Music City. Music City Vocal Groups-Greasy Love Songs Of Teenage Romance, Regret, Hope and Despair is also the perfect introduction to Ray Dobard’s legendary Music City label. Thanks for thorough review – seems like one for the buy list. Regards Thom.